One of my favourite creatures of Yellowstone is this dark greyish-black bird that is seen in shallow rapids and fast moving water. 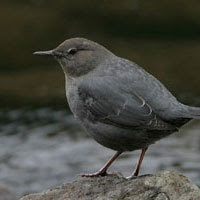 The American Dipper (also known as the Water Ouzel) is about the size of a robin and rather unremarkable in its outside appearance. The Dipper can be found in mountain waters from Panama to Alaska. It doesn't really migrate so in Yellowstone it is seen in the dead of winter, standing on rocks in icy waters, "dipping" at the knees. These birds sing year-round to claim a certain patch of river as their territory. The Dipper lives entirely off of aquatic insects and occasionally a tadpole or small fish. To get these it must go into and under the water. Dippers have special nostrils that close underwater and an extra eyelid that allows it to be able to see. They have strong enough feet that they can walk on the bottom of the river while completely submerged by gripping rocks with their feet. Even more amazing, they dive into the stream and "fly" underwater by flapping their wings. In fact, Dippers can even fly/swim upside-down. It can be a dangerous life at times. Because of their underwater habits, sometimes this little bird becomes prey to a salmon or some other large fish it may encounter. 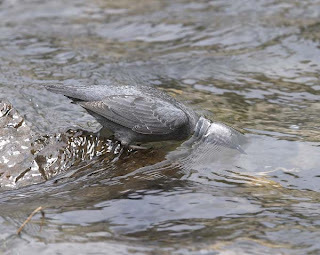 The presence of Dippers shows good water quality. They can't survive near a polluted stream. I am always amazed to see this plucky little bird standing in the middle of rivers surrounded by snow doing its characteristic "dipping" at the knees. Long after everyone else is bored, I keep watching it dive in and out of the icy waters. I think about persistence. Sometimes smallest, most unremarkable looking creatures do the most incredible things when we can’t see. We could a lot from the Dipper. Good to have "The Chronicles of Rachel" continue. "I have come home at last! This is my real country! I belong here. This is the land I have been looking for all my life, though I never knew it till now...Come further up, come further in!"